BCS Coventry awarded prizes in June 2017 to two University of Warwick, Computer Science students for their outstanding projects. 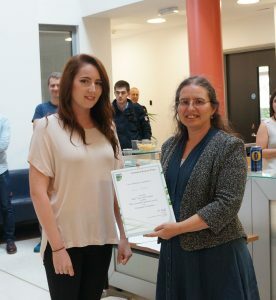 Hannah ROYLANCE, was awarded the Best Third Year Project 2017, on the BSc Computer Science degree. Thomas KILMINSTER was awarded the Best Third Year Project 2017, on the MEng Computer Science degree. Both students were awarded prizes of £100, and a free membership of BCS.